If you are planning a Grand Canyon vacation, it is imperative that you schedule your visit in such a way that you will get to observe the most fascinating and awe-inspiring aspects of the national park. The landscape in and around the Grand Canyon is not only powerful, but, possesses an immense amount of beauty that must be seen to truly appreciate all that this park has to offer. Through its exceptional size, mesmerizing features, and raw beauty, the park has the ability to captivate and overwhelm the senses. The unique collaborations of erosional geographic formations and vibrant colors uniquely combine to provide guests with an once-in-a-lifetime experience. In this visitor guide, you will be introduced to the top 5 must-see Grand Canyon attractions that you should put on your agenda when visiting the park. When planning your Grand Canyon vacation, it is absolutely essential that you make arrangements to view the Cape Royal. This is located at the southernmost viewing area on the Grand Canyon’s North Rim. This offers you the widest panoramic view of any overlook located within the national park. You may access this location through the Cape Royal Trail. 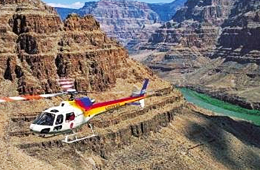 It may also be observed by taking a helicopter tour of the Grand Canyon. From this location, you may observe a small area of the Colorado River in the east. This is located at the lower section of the Unkar Creek; however, the main Grand Canyon attraction in the south is an isolated and heavily wooded mesa that is surrounded by a large assortment of vertical cliffs, called “Wotans Throne”. In addition to this, you may see the Freya Castle a tad to the east of the Cape Royal viewing area. 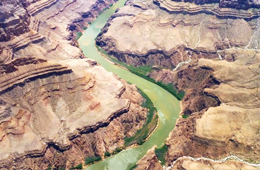 One of the most popular Grand Canyon attractions is the Colorado River. This river carves out a unique path through the national park that actually relays the story of the formation of the earth, as well as its overall structure. The depth of this river starts at a vertical mile starting at the Grand Canyon Village to the South Rim. Then, there are other locations within the park that are up to 6,000 feet. The width measures from an average of 10 miles to an astounding 18 miles when measured from one rim to another rim. The river has flowed through numerous layers of limestone, granite, sandstone, and schist in order to create the rock sequences and formations that may be viewed on your Grand Canyon vacation. 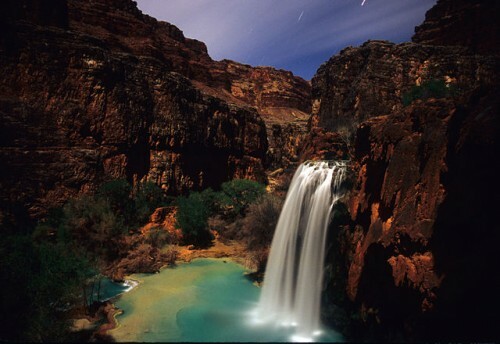 The next of the must-see destinations within the Grand Canyon is Havasupai Falls. The water flowing from these waterfalls is vibrant blue, which creates an amazing and awe-inspiring contrast against the bright red and orange walls of the Grand Canyon. The Havasu Falls plunges at approximately 100 feet and lands inside of a pool of water that perfectly create a blue and green combination that is exceptionally appealing to visitors. Considered to be the most striking and popular of all waterfalls, this area includes a relaxing and open sandy beach, as well as a wide variety of beautiful cottonwood trees. When it comes to Grand Canyon attractions, the South Rim is considered to be the most popular among tourists. This unique location attracts well over 5 million different people on an annual basis. Not only is this the most accessible location, but, it also offers travelers on their Grand Canyon vacation the most amenities of any location in and around the national park. In order to get the best views from this location at the Grand Canyon, you should plan your visit early in the morning, or late in the day. At other periods of time, the sun has a tendency to flatten the overall viewing experience and soften the natural, robust colors associated with the national park. Horseshoe Bend is, by far, one of the most popular Grand Canyon attractions. Whether you view this region by the trailhead or by air, you are sure to enjoy the ever-changing colors of the rocks that line the bend of the Colorado River. The river creates a sparkle and shine that exhibits the purest form of nature within the national park. The river sweeps around an immense escarpment created from sandstone. The scene is so immense that it is often impossible to obtain a picture of the complete bend; however, to see it in person is an absolute must for any natural enthusiast. When planning your Grand Canyon vacation, you should outline all of the attractions that are considered to be exceptionally popular by travelers. Cape Royal, the Colorado River, Havasupai Falls, the South Rim, and Horseshoe Bend are all the top-rated Grand Canyon attractions that will truly allow you to observe the history, the landscapes, the colors, and the formations that are native to the national park. 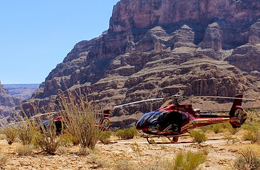 You may observe these locations by hiking, by biking, or by taking a helicopter tour in and around the Grand Canyon. To truly enhance your Grand Canyon vacation, you should always explore each of these areas in as many ways as possible!